Today’s adventure is a private guided super-jeep tour of the Golden Circle, a popular tourist route that contains some of the country’s most famous attractions. The first stop is Þingvellir National Park, an area of unique geology and the site of Iceland’s ancient assembly grounds. Next is the Haukadalur geothermal area, home of Geysir—the original geyser—and the more active Strokkur, which spouts a stream of boiling water up into the air every few minutes. 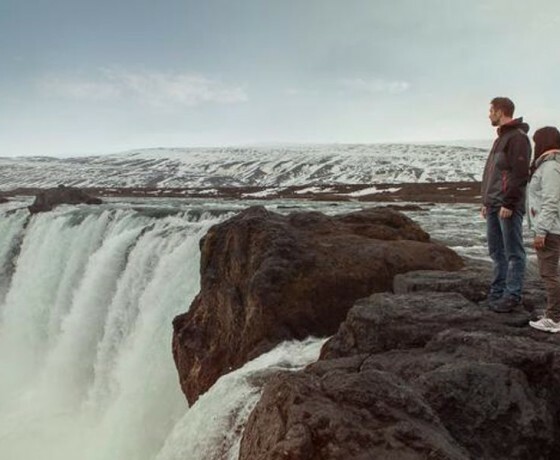 Then visit the beautiful waterfall Gullfoss, the queen of Iceland’s waterfalls and Langjökull Glacier, where you will enjoy a thrilling snowmobile tour. Finally, you will visit the implosion crater Kerið before heading back to your hotel. Today’s adventure is a private guided super-jeep tour of the Golden Circle, a popular tourist route that contains some of the country’s most famous attractions. 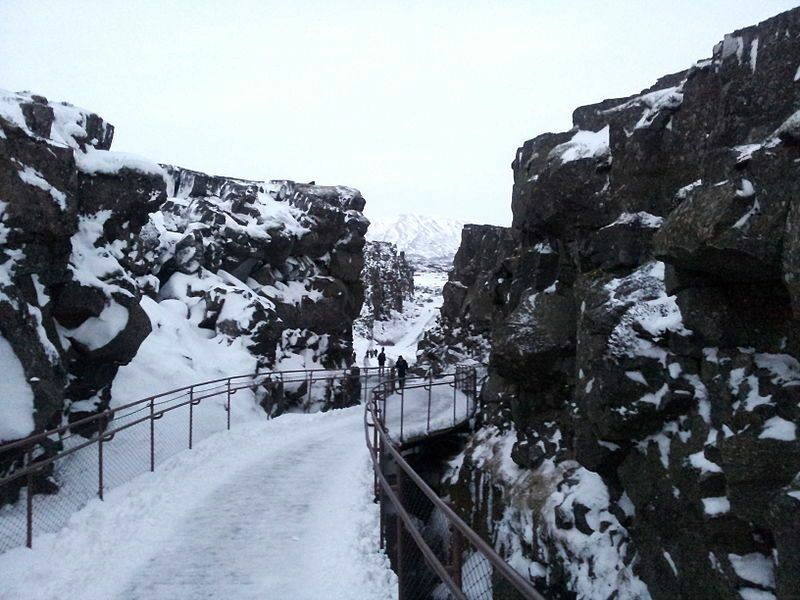 The first stop is Þingvellir National Park, an area of unique geology and the site of Iceland’s ancient assembly grounds. Next is the Haukadalur geothermal area, home of Geysir—the original geyser—and the more active Strokkur, which spouts a stream of boiling water up into the air every few minutes. Then visit the beautiful waterfall Gullfoss, the queen of Iceland’s waterfalls and Langjökull Glacier, where you will enjoy a thrilling snowmobile tour. Finally, you will visit the implosion crater Kerið before heading back to your hotel. Today’s adventure is a private guided super-jeep tour of the Golden Circle, a popular tourist route that contains some of the country’s most famous attractions. The first stop is Þingvellir National Park, an area of unique geology and the site of Iceland’s ancient assembly grounds. Next is the Haukadalur geothermal area, home of Geysir—the original geyser—and the more active Strokkur, which spouts a stream of boiling water up into the air every few minutes. Then visit the beautiful waterfall Gullfoss, the queen of Iceland’s waterfalls and Langjökull Glacier, where you will enjoy a thrilling snowmobile tour. Finally, you will visit the implosion crater Kerið before heading back to your hotel. Today’s adventure is a private guided super-jeep tour of the Golden Circle, a popular tourist route that contains some of the country’s most famous attractions. The first stop is Þingvellir National Park, an area of unique geology and the site of Iceland’s ancient assembly grounds. Next is the Haukadalur geothermal area, home of Geysir—the original geyser—and the more active Strokkur, which spouts a stream of boiling water up into the air every few minutes. Then visit the beautiful waterfall Gullfoss, the queen of Iceland’s waterfalls and Langjökull Glacier, where you will enjoy a thrilling snowmobile tour. Finally, you will visit the implosion crater Kerið before heading back to your hotel. Today’s adventure is a private guided super-jeep tour of the Golden Circle, a popular tourist route that contains some of the country’s most famous attractions. The first stop is Þingvellir National Park, an area of unique geology and the site of Iceland’s ancient assembly grounds. Next is the Haukadalur geothermal area, home of Geysir—the original geyser—and the more active Strokkur, which spouts a stream of boiling water up into the air every few minutes. 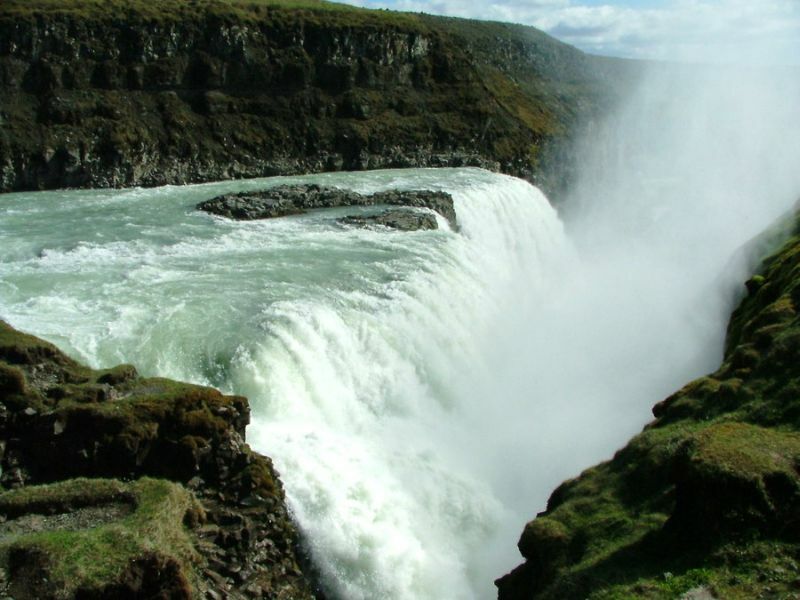 Then visit the beautiful waterfall Gullfoss, the queen of Iceland’s waterfalls and Langjökull Glacier, where you will enjoy a thrilling snowmobile tour. Finally, you will visit the implosion crater Kerið before heading back to your hotel. Today’s adventure is a private guided super-jeep tour of the Golden Circle, a popular tourist route that contains some of the country’s most famous attractions. The first stop is Þingvellir National Park, an area of unique geology and the site of Iceland’s ancient assembly grounds. 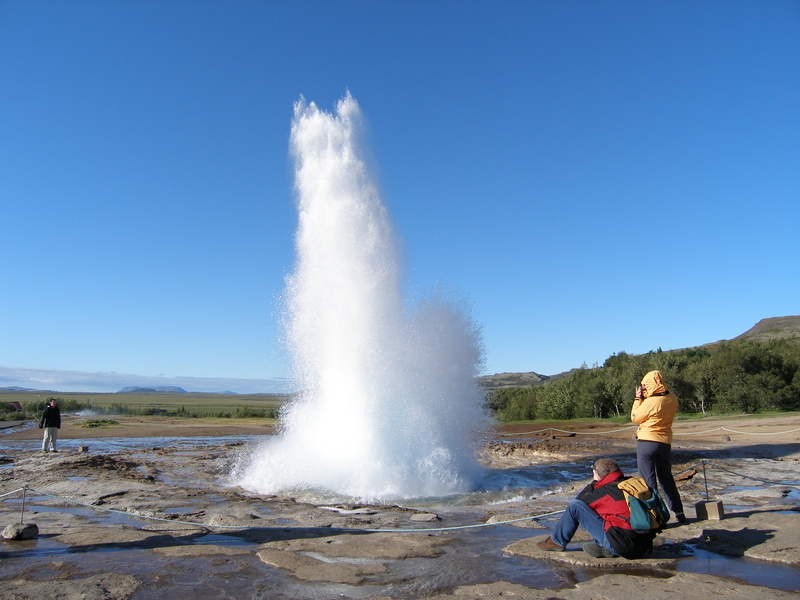 Next is the Haukadalur geothermal area, home of Geysir—the original geyser—and the more active Strokkur, which spouts a stream of boiling water up into the air every few minutes. Then visit the beautiful waterfall Gullfoss, the queen of Iceland’s waterfalls and Langjökull Glacier, where you will enjoy a thrilling snowmobile tour. Finally, you will visit the implosion crater Kerið before heading back to your hotel. Today’s adventure is a private guided super-jeep tour of the Golden Circle, a popular tourist route that contains some of the country’s most famous attractions. 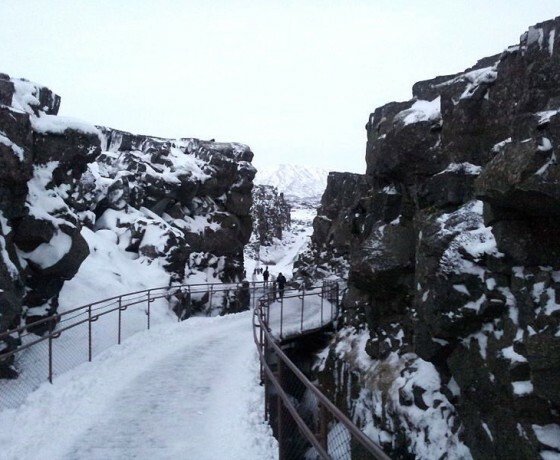 The first stop is Þingvellir National Park, an area of unique geology and the site of Iceland’s ancient assembly grounds. Next is the Haukadalur geothermal area, home of Geysir—the original geyser—and the more active Strokkur, which spouts a stream of boiling water up into the air every few minutes. 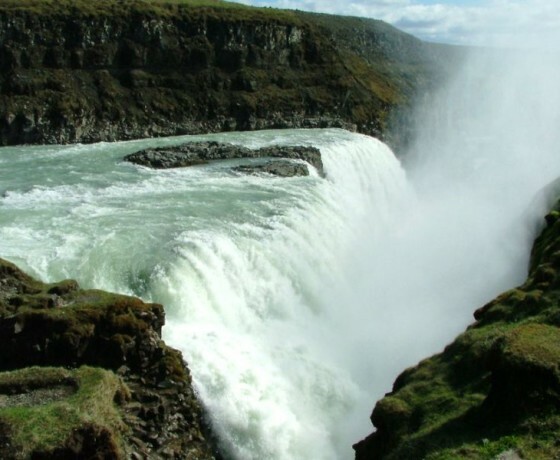 Then visit the beautiful waterfall Gullfoss, the queen of Iceland’s waterfalls and Langjökull Glacier, where you will enjoy a thrilling snowmobile tour. Finally, you will visit the implosion crater Kerið before heading back to your hotel. Today’s adventure is a private guided super-jeep tour of the Golden Circle, a popular tourist route that contains some of the country’s most famous attractions. The first stop is Þingvellir National Park, an area of unique geology and the site of Iceland’s ancient assembly grounds. Next is the Haukadalur geothermal area, home of Geysir—the original geyser—and the more active Strokkur, which spouts a stream of boiling water up into the air every few minutes. Then visit the beautiful waterfall Gullfoss, the queen of Iceland’s waterfalls and Langjökull Glacier, where you will enjoy a thrilling snowmobile tour. Finally, you will visit the implosion crater Kerið before heading back to your hotel. Today’s adventure is a private guided super-jeep tour of the Golden Circle, a popular tourist route that contains some of the country’s most famous attractions. The first stop is Þingvellir National Park, an area of unique geology and the site of Iceland’s ancient assembly grounds. Next is the Haukadalur geothermal area, home of Geysir—the original geyser—and the more active Strokkur, which spouts a stream of boiling water up into the air every few minutes. Then visit the beautiful waterfall Gullfoss, the queen of Iceland’s waterfalls and Langjökull Glacier, where you will enjoy a thrilling snowmobile tour. Finally, you will visit the implosion crater Kerið before heading back to your hotel. Today’s adventure is a private guided super-jeep tour of the Golden Circle, a popular tourist route that contains some of the country’s most famous attractions. The first stop is Þingvellir National Park, an area of unique geology and the site of Iceland’s ancient assembly grounds. Next is the Haukadalur geothermal area, home of Geysir—the original geyser—and the more active Strokkur, which spouts a stream of boiling water up into the air every few minutes. Then visit the beautiful waterfall Gullfoss, the queen of Iceland’s waterfalls and Langjökull Glacier, where you will enjoy a thrilling snowmobile tour. Finally, you will visit the implosion crater Kerið before heading back to your hotel. Today’s adventure is a private guided super-jeep tour of the Golden Circle, a popular tourist route that contains some of the country’s most famous attractions. The first stop is Þingvellir National Park, an area of unique geology and the site of Iceland’s ancient assembly grounds. Next is the Haukadalur geothermal area, home of Geysir—the original geyser—and the more active Strokkur, which spouts a stream of boiling water up into the air every few minutes. 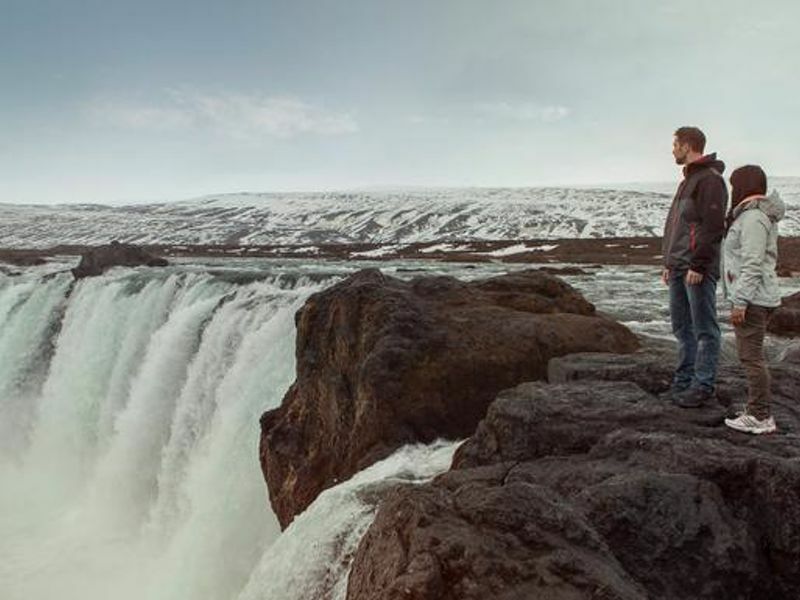 Then visit the beautiful waterfall Gullfoss, the queen of Iceland’s waterfalls and Langjökull Glacier, where you will enjoy a thrilling snowmobile tour. Finally, you will visit the implosion crater Kerið before heading back to your hotel. Today’s adventure is a private guided super-jeep tour of the Golden Circle, a popular tourist route that contains some of the country’s most famous attractions. The first stop is Þingvellir National Park, an area of unique geology and the site of Iceland’s ancient assembly grounds. Next is the Haukadalur geothermal area, home of Geysir—the original geyser—and the more active Strokkur, which spouts a stream of boiling water up into the air every few minutes. 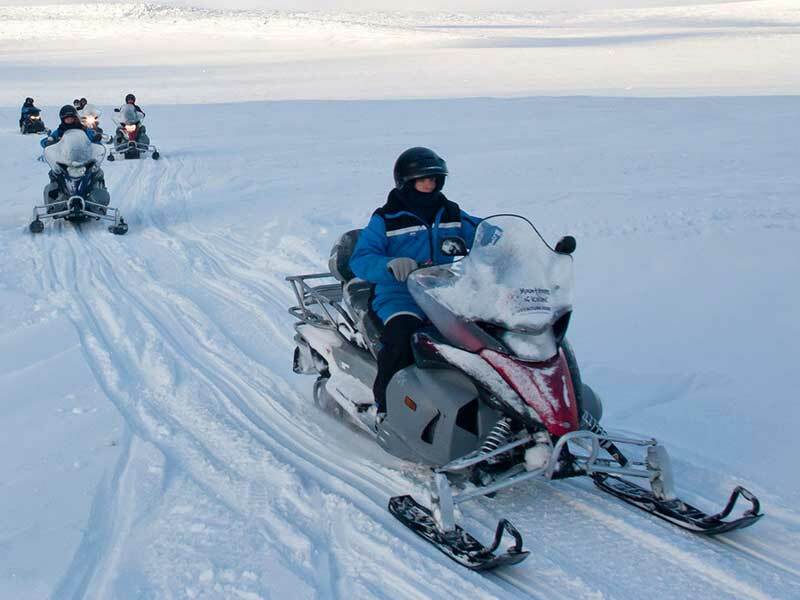 Then visit the beautiful waterfall Gullfoss, the queen of Iceland’s waterfalls and Langjökull Glacier, where you will enjoy a thrilling snowmobile tour. Finally, you will visit the implosion crater Kerið before heading back to your hotel. Today’s adventure is a private guided super-jeep tour of the Golden Circle, a popular tourist route that contains some of the country’s most famous attractions. The first stop is Þingvellir National Park, an area of unique geology and the site of Iceland’s ancient assembly grounds. Next is the Haukadalur geothermal area, home of Geysir—the original geyser—and the more active Strokkur, which spouts a stream of boiling water up into the air every few minutes. 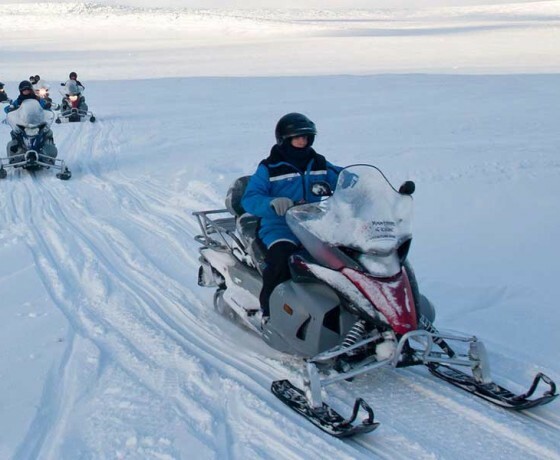 Then visit the beautiful waterfall Gullfoss, the queen of Iceland’s waterfalls and Langjökull Glacier, where you will enjoy a thrilling snowmobile tour. 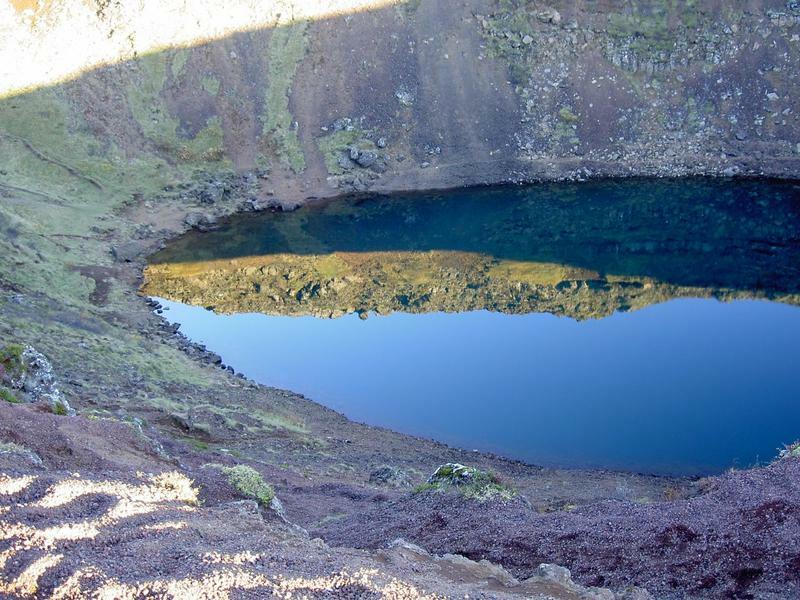 Finally, you will visit the implosion crater Kerið before heading back to your hotel. 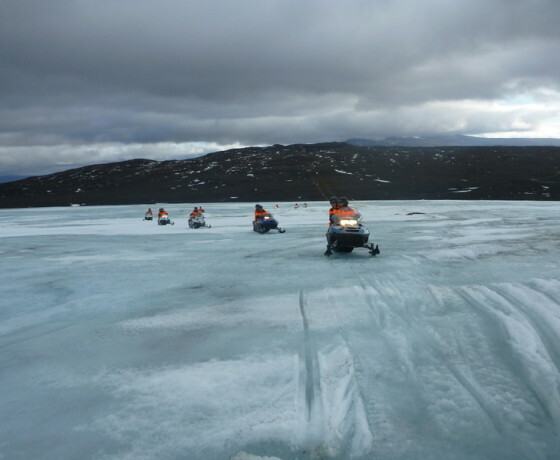 In the morning you’ll be picked up and privately transferred to Reykjavik Airport for your short flight to Akureyri, where a day of spectacular sights awaits you on a private 4x4 super-jeep safari. 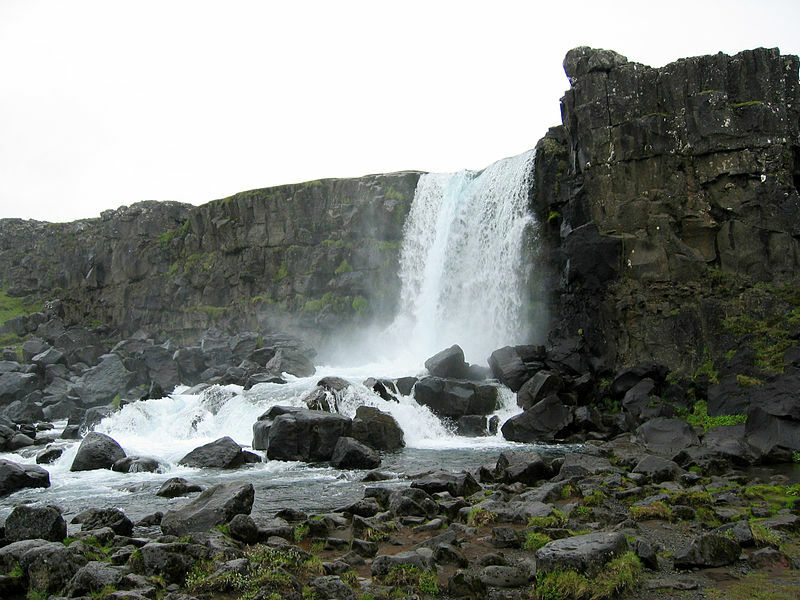 Your guide will take you first to Goðafoss (“the waterfall of the gods”) on your way to the Lake Mývatn area, where you will then visit such natural wonders as the Dimmuborgir lava maze, the Skútustaðagígar pseudo-craters, the boiling mud-pots at Námafjall and the Krafla volcanic system. Today’s adventure ends with a stop at the Mývatn Nature Baths, where you can enjoy soaking in the soothing warm geothermal waters surrounded by a lava field. Afterwards, you will be returned to your accommodation in Akureyri. Spend the night in the Akureyri. 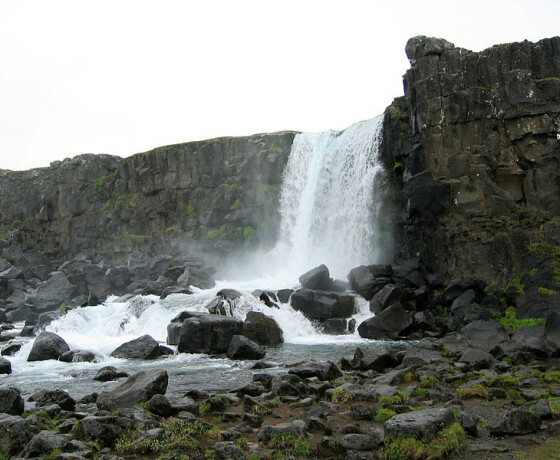 Start the day with a guided 4x4 super-jeep excursion to Dettifoss, Europe's most powerful waterfall. Standing next to this 44 metre-high, 100 metre-wide cascade with its great surge of water rumbling into the canyon is an incredible experience that is sure to leave a lasting impression. You will also have another opportunity to relax at the Mývatn Nature Baths surrounded by the beautiful volcanic landscapes. Afterwards, you’ll be taken to Akureyri airport in time for your flight back to Reykjavik. Spend the next three nights in Reykjavik. 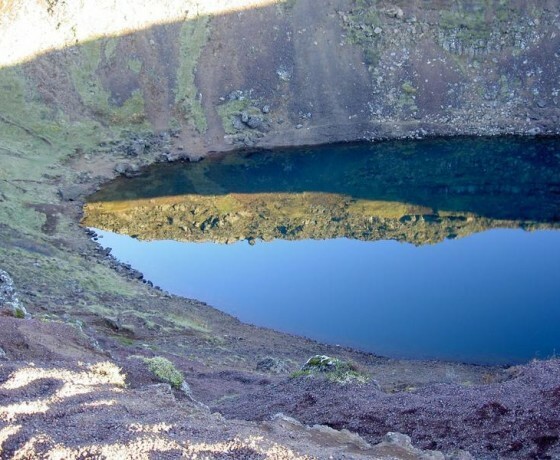 On this exclusive private helicopter tour you will fly over Þórsmörk Nature Reserve and land on the volcanic crater at Fimmvörðuháls. The flight path also includes the Eyjafjallajökull glacier and volcano, which erupted in 2010, and the glacier tongue Gígjökull, which was split in half by molten lava. If weather allows, you may also be able to see Hekla, one of Iceland’s most active volcanoes, and the volcanic Westman Islands. En route back to the capital, your pilot will take you over the Hengill pass for a bird’s eye view of the power plants that harness geothermal energy to heat the homes of Reykjavik. 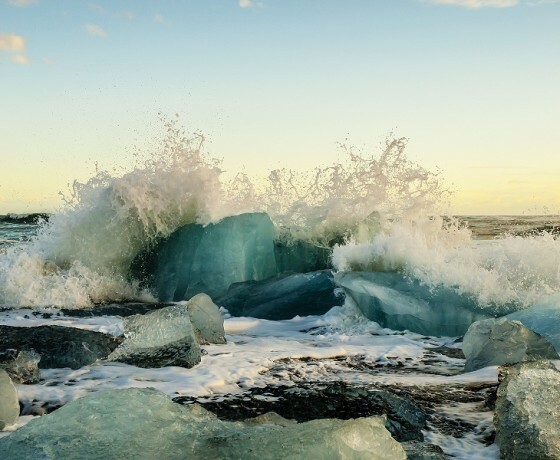 On return to Reykjavik, you’ll be taken to one of Reykjavik´s relaxing spas to enjoy a 50-minute massage and then relax in the sauna and jacuzzi as long as you wish. Today you are free to explore the city and its surroundings at your leisure. Downtown Reykjavík offers a wide range of attractions, including Alþingi (Icelandic Parliament) and wonderful bird‘s eye views from the tower of Hallgrímskirkja church, the city’s most visible landmark. There are also plenty of exciting optional activities and day tours to choose from, such as glacier hiking, caving, horse riding, super jeep tours to the south coast, helicopter tours, whale watching and more. After pick up from your hotel, your guide will take you on a 4x4 super-jeep excursion to the volcanic Reykjanes Peninsula, where you will visit the geologically active Lake Kleifarvatn area and the colourful Seltún area of Krýsuvík with its boiling mud-pots. 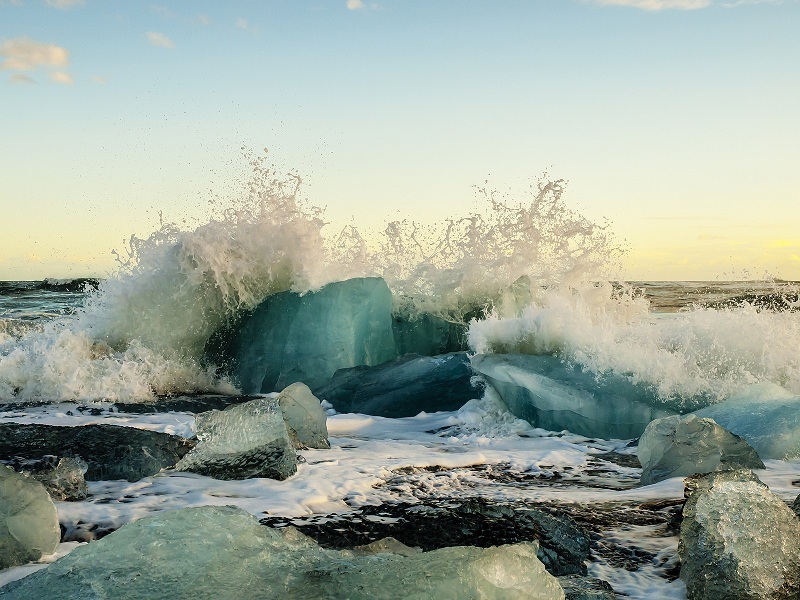 Before heading to the airport, you will also have some time to experience Iceland’s famous Blue Lagoon, a geothermal spa renowned for its mineral-rich waters surrounded by a moon-like lava field. Here you will enjoy a few hours in the Exclusive Lounge with complimentary towels, bathrobe, slippers and light refreshments as well as a deep, relaxing half-hour massage in the warm water of the lagoon. After this wonderful last memory of Iceland, your guide will drive you to Keflavik Airport for your departure flight. Note: If your flight is in the morning, we can change your travel itinerary accordingly. We are also happy to customize your holiday with additional day tours or extra nights in Reykjavik, Akureyri or other locations not listed in the itinerary. Please contact us for details. Due to scheduled renovations to the facilities, the Blue Lagoon will be closed from 5 through 21 January 2016 inclusive. The whole group was very well organised and I saw a lot more of Thailand than I would have if I'd traveled on my own. The two tour guide (Devendra Dimri & Arun Nanda) we had on the trip were fantasic: funny, caring and always there for you. It's a great way to explore the different sites of Thailand. Thank you mech Journeys for organising and very well executed our group . The whole group was very well organised and I saw a lot more of Thailand than I would have if I'd traveled on my own. Thanks for the wonderful customer service you provided for my honeymoon trip to Australia with Tahiti Bora Bora. Thank you for responding quickly to all my questions with patience and helping me get all the information needed. Your service was greatly appreciated. I didn't face any problem such as I usually do when booking through other airline travel company..
MecH journeys is very lucky to have people like you. I am a Director of marketing myself, and I wish I had people like you on my team. Your company and team members should be proud of you. As a very happy customer, I will be marketing for MecH journeys - all because of my excellent experience. Wish you all the success in your career. Once again, thank you. Thanks for the wonderful customer service you provided for my honeymoon trip to Australia with Tahiti Bora Bora. Thank you for responding quickly to all my questions with patience and helping me get all the information needed.